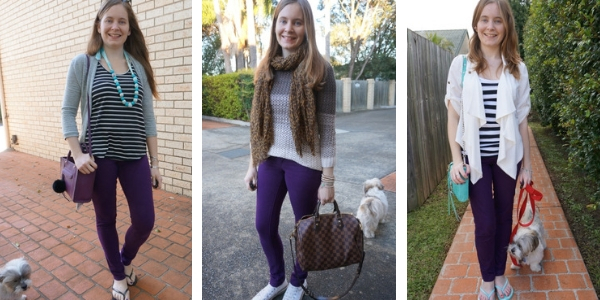 Wow you really utilised those purple jeans hun! So many different ways to style them. You look fab in them. Have a wonderful weekend. I could never come up with so many amazing outfits with the same garment. As you know I have just become a jeans wearer and have just found a pair of skinny jeans in a charity shop - I will do a post soon. I LOVE those purple pants! I just don't know how we wear anything without stretch, though. I have a pair of jeans that look great on me but I rarely wear them because they have no stretch. I have a couple of pairs of colored jeans and I just don't wear them. This weekend I'm going to wear a pair of them because there's no excuse. I just don't think of them. 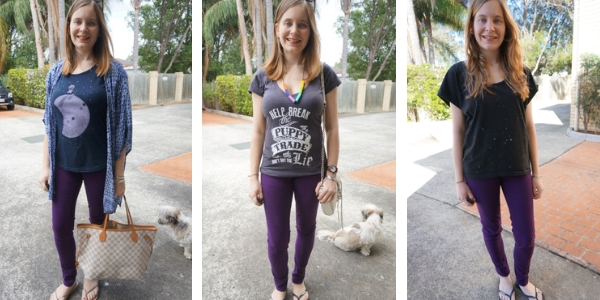 It's wonderful getting to see all 30 ways you wore it at $1 per wear! Purple is such a fantastic hue! I'm currently preparing a post too with a purple outfit. Leggings are so comfy and versatile. You look stunning! 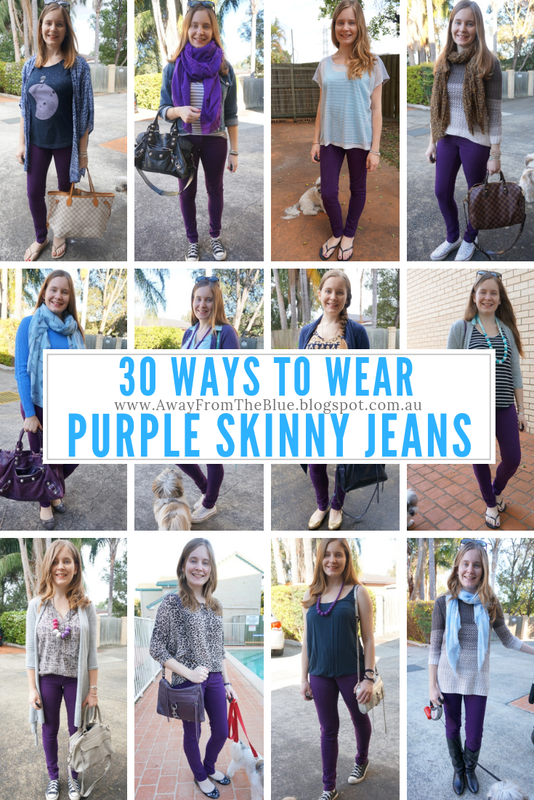 Yes these purple jeans have been so versatile. I'm sure your purple leggings will be too! Gosh! I never really knew that purple with go with turquoise or pink. Great way to wear this jeans, Mica:) So awesome to see and definitely inspiring. I am so glad our aircon is fixed! it's been a hot summer! I'm glad I could introduce some new colour combos to you! These are all lovely outfits! I have to admit I donated my only pair of coloured jeans in the great purge of 2018... they weren't getting as much love so had to go... but like you demonstrated can be really versatile! I think you're not alone there - there are a lot in opshops! I love mine though, never going to get rid of them! Love your 30 wears series! Those purple jeans are so fun! I feel like I don't wear my colored denim often enough. Love all of this inspo! 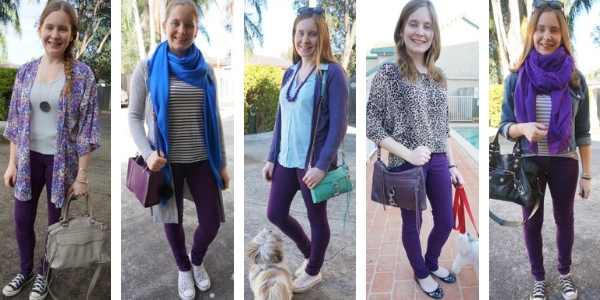 You definitely need some purple jeans! You really are so impressive with how you get so much wear from your clothing, Mica. And it goes to show that colored jeans really work with so many outfits!! I have a lilac pair and love them to death. Thanks for the reminder to pull them out! Wow, 30 ways!! That is impressive! I am proud of myself if I can come up with more than 3 but this is a whole new level! Glad to hear you got your A/C fixed!! Enjoy your weekend! 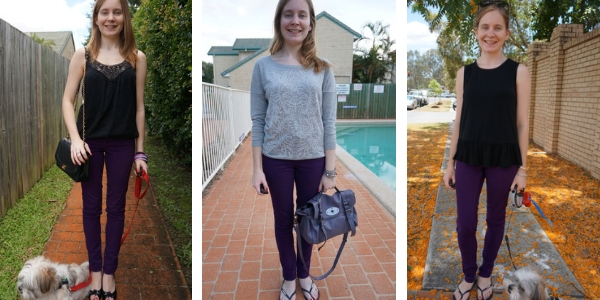 I would never have put purple jeans in the category of being versatile, but they really are! I love all the ways you've styled them, and I actually love how they look with other colors, especially pink and turquoise. So pretty! 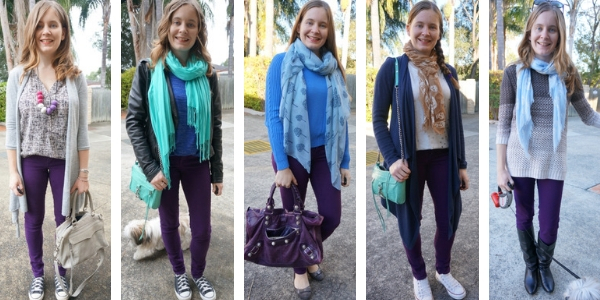 You did a great job mica showing the versatility of the purple jeans! I would have never thought of them in all the ways you did. That cost per wear is awesome! Wowzie no one could ever accuse you of not being resourceful. Love this post! 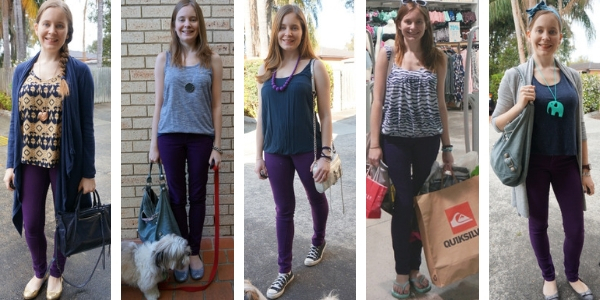 You have certainly demonstrated the versatility of purple skinny jeans with this challenge! Colored denim can be so fun to wear! Happy weekend Mica! 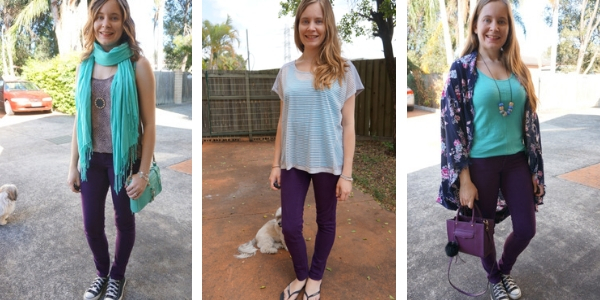 Those purple jeans are so versatile! I'd never imagined! I like every version you styled them, especially in the outfits with pink and tees! Wow that's a whole lot of looks my dear. I totally love them. They have definitely been a good investment in my wardrobe! These are such cute ways to wear it! I love all of the looks you put together. It depends on how low or high-waisted the jeans are, haha! These ones still fit but there are some pairs I gave up! Colorful jeans are so much fun and a nice change from denim jeans. I love the color purple and woahh you've created so many awesome looks with them. I had no idea you could wear purple in so many ways. I love it. Thanks for sharing! Wow! What a great roundup! You have definitely gotten some great wear from those jeans. I love how they look paired with bright turquoise! That isn't a color combination I would have thought of! "Gemma • Gemma Etc . ❤️ "
I just rediscovered my purple pants this week. So I so going to try out these color combo out. I hope your kids have an awesome birthday this weekend. I have to work tomorrow. Then on Sunday is laundry day for me. I love you for inspiring me to start wearing my coloured jeans again! I have been rocking my red one so much and am loving the pop of colour. I haven't seen purple skinny jeans before but I LOVE IT!! It is such a nice color and you do a great job with pairing them with different tops. Oh wow, you paid such a great price for the jeans!! It is so easy to pair them with different colors. You make me one to get a pair myself! I did score these for an awesome price on sale! Thanks Sasha! they are a lot of fun to put together! I love how versatile these jeans are! I should try to wear my wardrobe staples as many ways as possible too. All chic looks! great looks, it was quite hard to pair them! I have a pair of purple skinny jeans, I have to wear them more often taking some inspiration form you! I love matchy matchy too! Great trousers. I talked to someone last week who was just back from a month to Australia and I immediately had to think of you! Hope you can find yours, glad I could inspire you! Loved how you did the challenge! You look great! I love skinny jeans, but never thought to grab them in a fun color! Love the purple...you can wear them all year long and for any season! Purple is not my color, but I could see myself getting a lot of wear out of another colored pair of denim - maybe red? Paired with a plain top it should look amazing. I haven't quite hit 30 wears with my red skinny jeans yet but I'm hoping to later this year when winter arrives! Wow, that was a lot of work taking all those photos. Love the purple and they look really cute on you. Have a great weekend. they are a fun alternative to classic blue! I love skinny jeans! They fit you perfectly. They are also look comfortable, with just the right amount of stretch. Would you like to follow each other? Wow you're really challenging yourself with this 30 ways series! Nice! I like that you don't shy away from purple jeans. Or blackberry? haha regardless, great looks! Love the looks, the purple can really look dressy. Great video, carina, and I love our voice! I'm sure you're a great singer! haha thanks! I don't sing though - my boys tell me to be quiet when I do, haha! I consider myself quite boring style wise but I love this post as you've totally shown how easy it is to incorporate a piece that could be considered quite difficult, into your everyday wardobe. Love it, you look fab! I loved how you used creativity to create so many amazing outfits. Have a great day! What great jeans, you really suit them! Of course you won me over with "purple" right there in the title! :) You do such a great job of rewearing the pieces in your wardrobe--I have purple skinny jeans and hardly ever think to wear them (although they're also a bit of a wonky fit)! I especially love how you paired the purple with turquoise! I would've never thought to snag a pair of purple jeans but I might need to reconsider that. I love how it adds a pop of color to your wardrobe and it seems like a perfect shade to wear for Fall. Not sure which is my favorite but you wear skinny jeans so well darling. I love the purple turquoise combo. How have you been? Ive been off social media for sometime to rest my hands and the pain from carpal tunnel syndrome. I'm sure you had a great holiday season. Sorry to hear you've been in pain, hope you rested up with your social media break! Love all the styling ideas! 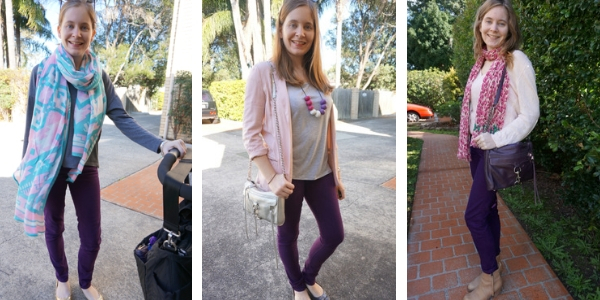 I love colored denim and these purple jeans are great! You found so many great ways to style them. My favorite has to be when you paired them with turquoise. It's such a bright color combination and I wouldn't have thought that it would work, but it looks great. Thanks for sharing all these fun looks. I hope you have a great week. They're such a lovely colour and I love that you've worn them so many different ways! I'm so boring all my jeans are black or blue - perhaps I need to follow your lead and take a step out of my colour comfort zone! What a versatile pair of jeans! I love colored jeans! Congrats on getting your cost per wear down to a $1! Even thought You've had them for a while, they are purple, so it's not like you wear them everyday. And it speaks for to them that you've held on to them for so long. What a great run these blackberry jeans have had ! and to think there is so much life and so many more wears in it. How great!!! already down to a dollar per wear is fab.